ever wondered what it looks like to rise from the ground through and above the rainforest? 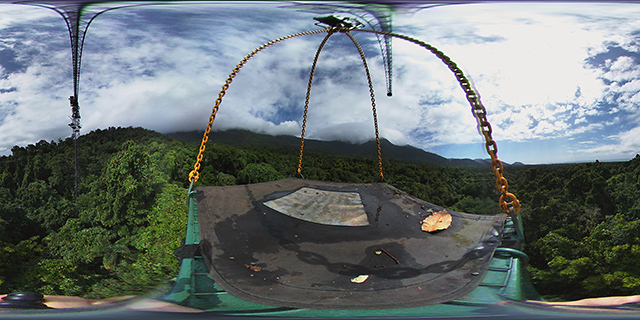 the video below provides a 360 degree view along a ride in the canopy crane at the daintree rainforest observatory at cape tribulation in far north queensland, australia. the compilation includes the ascent from the ground through the canopy, a ride above the rainforest, the sampling of a branch, and the final descent back to the ground. be sure to look around in the video by dragging the view or moving your device around. best viewed at maximum quality and with a VR headset. recorded with LG 360 Cam. fun side fact: in the video, the gondola is swinging slightly but the horizon stays locked in. looks like the camera is automatically stabilising the field of view!